Months after moving embassy to J'lem, Paraguay says it is returning its embassy. In response, Netanyahu orders embassy in Paraguay closed. Three-and-a-half months after transferring its embassy to Jerusalem, the government of Paraguay has announced that it is moving the embassy back to Tel Aviv. Speaking to reporters, Paraguayan Minister of Foreign Affairs Luis Castiglioni said that "Paraguay wants to contribute to an intensification of regional diplomatic efforts to achieve a broad, fair and lasting peace in the Middle East." It is unclear what the timetable will be for the return move. In response to the announcement, Prime Minister Netanyahu instructed the foreign ministry to return the Israeli ambassador to Paraguay back to Israel for consultations, and to close the Israeli embassy in Paraguay. 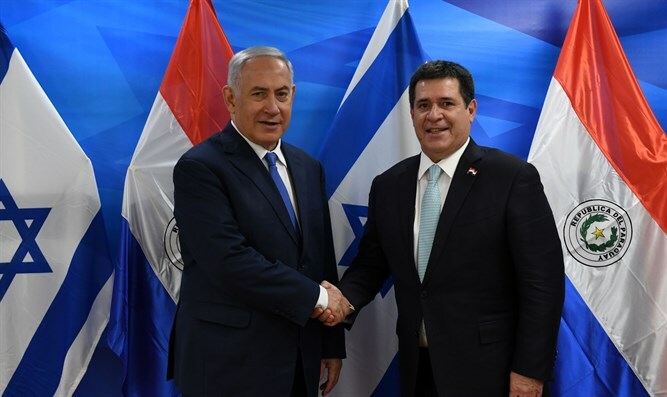 “Israel views with great severity the unusual decision of Paraguay which will cloud relations between the countries,” the foreign ministry said.